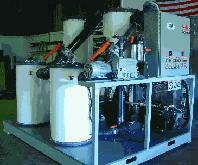 LOOKING FOR WASTEWATER TREATMENT SOLUTIONS? Call Us At 1-800-295-8848 Or 877-433-0175 For More Information! 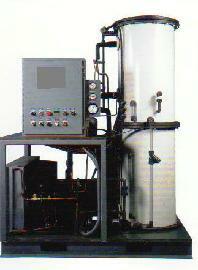 ADVANCED MDP STYLE LOW-TEMPERATURE VACUUM DISTILLATION FOR WASTEWATER RECYCLING AND PROCESS CHEMICAL RECOVERY. UNITS OPERATE BY AN ENERGY EFFICIENT HEAT PUMP, (STEAM/CHILLED WATER UNITS ALSO AVAILABLE). CAPACITIES FROM 50 to 20,000 GAL/DAY. STANDARD SS HEAT EXCHANGERS WITH OPTIONAL TITANIUM OR HASTELLOY C-22 FOR AGRESSIVE APPLICATIONS. COPYWRITE INCLUDING IMAGES ENVIRO PURE, INC., 2001 - 2012, ALL RIGHTS RESERVED. SEE "CONTACT US" PAGE FOR SITE DISCLAIMERS.